George Fernandes the Giant Killer of Indian politics is no more. George Fernandes, the 88-year-old socialist politician and hero of the Emergency breathed his last in New Delhi on Tuesday morning. Fernandes was physically debilitated as he had Alzheimer and Parkinson disease. He was under the care of his estranged wife, Leila Kabir Fernandes, and his son, Sean . His long-time companion, Jaya Jaitly, his brothers in Karnataka and old party workers were permitted to meet him occasionally after several applications. But in last few years he was unable to recognize them as he had developed alzeihmer’s disease. He was known for taking risks, changing sides, but retaining his charisma. All through his life, his brave choices have left everyone perplexed. Fernandes was born in Mangaluru in Karnataka in June 1930 to a Mangalorean Catholic family. In 1946, at the age of 16, he was sent to St. Peter Seminary in Bangalore to be trained as Roman Catholic priest. He studied philosophy for two years. Later he left the seminary and headed for a new life. At the age of 19 years, he organised exploited workers in the road transport industry and the hotels and restaurants in Mangalore. ALSO, READ| New Era! Saudi Arabia is Deciding to Remove Ban on Women Drivers! In 1949 he went to Bombay to search for a job. He went through a very tough phase where he had to sleep on the streets until he joined a newspaper as a proofreader. Later he came in contact with influential people like veteran union leader Placid D’Mello who known as the “King of the Dockyards” and the socialist Rammanohar Lohia. They highly influenced him and he joined the socialist trade union movement. The huge leap in his life came when he contested from Bombay South for a Lok Sabha election as a candidate of Samyukat Socialist Party (SSP) against the all-powerful S.K.Patil of the Congress in 1967. He won by 48.5% votes and thus earning his nickname, “George the Giantkiller”. In 1969, he was selected as the General Secretary of the Samyukta Socialist Party. Moreover, in 1973 he became the Chairman of the Socialist Party. Unfortunately, Fernandes failed to make major inroads in Bombay’s growing private-sector industries. The anti-Congress politics started gaining ground across the country as he was involved in trade unionism. In 1974, Fernandes organized nationwide railway strike for 20 days. It was the biggest strike till date that threatened to paralyze the country. Later, as an act of resistance against Indira Gandhi’s Emergency, he plotted to procure dynamite sticks to set off explosions near the venue of Indira Gandhi’s rally with only intention to scare people. Soon he was arrested in the “Baroda Dynamite Case” which allegedly involved a plan to loot a train carrying arms from Pimpri to Bombay. His arrest and a photograph, lifting his handcuffed fist in defiance became the most powerful image of the Emergency movement. Sushma Swaraj who is our Current Minister for External Affairs was a law student at that time and volunteered her services to fight the case. In 1977 he plunged into the national politics and he emerged victorious in the Lok Sabha poll from Muzzaffarpur in Bihar. But he contested in absentia which the students campaigned voluntarily. Further, in 1984 he lost by a margin of 40000 votes when he fought from Karnataka, Bangalore North. During the reign of Moraji Desai led Janata party Government, Fernandes was made the Industry Minister. On the contrary he was famously known for banning Coca Cola in India. In 1980, after a short span in the Janata government, he again regained his Muzzafapur seat. In 1989, a new Janata Dal was formed where Fernandes contested from Muzaffarpur. The V.P. Singh government made him the railway minister. During his tenure as a railway minister, he led the Konkan Railway project connecting the Konkan and Malabar coastline. It was one of his biggest achievement in his political career. As Lalu Prasad Yadav emerged as a newly-emerged Mandal leader he was sidelined. Hence, Fernandes and Nitish Kumar broke away from the Janata Dal in 1995 to form the Samata Party. The newly formed Samata Party allied with the Bharatiya Janata Party which is currently known as Bharatiya Jana Sangh. In the 1996 general elections, BJP along with its allies had short lived only for 13 days. the two United Front governments (1996–1998) led by Janata Dal ministers H. D. Deve Gowda and Inder Kumar Gujral. 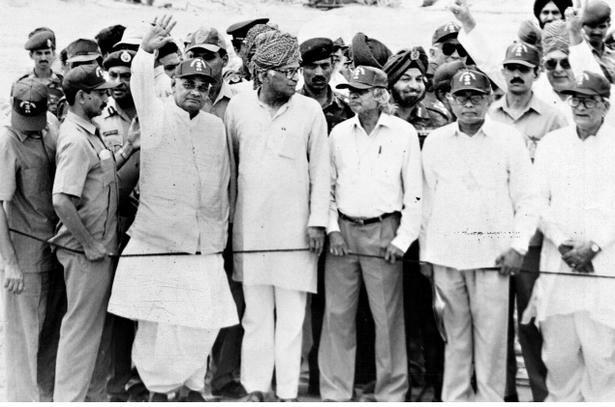 He not only embraced the BJP but also, despite his stance against nuclearisation, became the Defence Minister under whom India conducted the Pokhran II tests. While Fernandes served as a Defence Minister, he visited Siachen 18 times- the highest battlefield in the world. Sometimes he carried Christmas cakes, sometime he wanted to be among the soldiers. Soon after the fall of the Vajpayee government in 2004, he found himself under the shadow of a new star, Nitish Kumar. He was not given a ticket in the Lok Sabha elections citing his ill health. A stroke left him mostly homebound untill his death. he death of the firebrand politician brings to a close of a turbulent chapter in Indian history, and the man whose handcuffed image defined it.